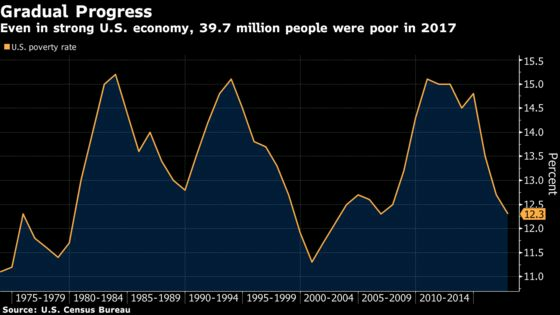 (Bloomberg) -- Americans’ household incomes rose in 2017 and the poverty rate declined amid solid job growth in the world’s largest economy. Yet inequality worsened -- by race, gender and income distribution. Median household income, adjusted for inflation, rose 1.8 percent last year to $61,372, from $60,309 in 2016, according to annual data on income and poverty from the Census Bureau on Wednesday. The level roughly matches highs in 1999 and 2007 when accounting for changes to the survey, according to the bureau, though it’s the smallest gain in three years. The poverty rate declined by 0.4 percentage point to an 11-year low of 12.3 percent, with 39.7 million people living in poverty. The better picture on overall incomes contrasted with the worsening disparities between groups last year, indicating the distribution of gains remains far from equal. Median earnings for men rose 3 percent to $44,408, while women earned $31,610, just 0.2 percent above 2016. Racial gaps widened, with the median income for black households down 0.2 percent to $40,258, while non-Hispanic white household income rose 2.6 percent to $68,145. Hispanic households fared better, with a 3.7 percent jump to $50,486. Overall, the data show Americans generally continue to see their lot improve amid healthy hiring and an unemployment rate near the lowest in almost five decades. At the same time, 10 years after the financial crisis marked by the collapse of Lehman Brothers Holdings Inc., the large number of poor people and persistent inequality are a reminder that many Americans have been left out of sharing the benefits of faster growth. Other key figures showed the share of Americans without health insurance was little changed at 8.8 percent, or 28.5 million. Meanwhile, the Gini index, the most common measure of income inequality, was 0.482 in 2017, little changed from 2016. The higher the number, the more unequal the income distribution. The income gain in the report could still be welcome news for Republicans ahead of the congressional midterm elections in November. Trump’s tax cuts implemented in 2018 may further boost growth, though his trade policy remains a risk for the economy, creating uncertainty for businesses and for employment. Democrats, meanwhile, could cite the inequality measures in their criticism of Trump and Republicans. The report showed the gap between the top and bottom earners widened further. Household income at the highest tenth of the earnings distribution rose 2.8 percent to $179,077 last year, while it increased 2.3 percent to $14,219 for the lowest tenth, the report showed. At the 95th percentile, household income jumped 3 percent to $237,034. The federal minimum wage has been $7.25 per hour since 2009, though various cities and states have lifted their own earnings floor to better reflect increases in the cost of living as well as a tight labor market. The details in the Census report were also consistent with the tightening job market that’s facing a shortage of skilled employees. The number of full-time, year-round workers rose by 2.4 million last year from 2016, signaling the availability of more such positions. About 75.3 percent of working men with earnings were in full-time, year-round jobs, up from 74.8 percent in 2016. For women, the share rose to 63 percent, from 62.2 percent.